O Priest and Bishop, and worker of miracles; O good shepherd of the people, pray to the Lord for us. O God, who in every age furnishes thy Church with new examples of virtue; grant thy faithful so to follow the footsteps of blessed Andrew, thy confessor and Bishop, as to come one day to share in his reward. Through our Lord Jesus Christ, thy Son, who liveth and reigneth with thee, in the unity of the Holy Ghost, God, world without end. Amen. The saintly Bishop, whose Feast we keep to-day, pressingly invites us, by his austere life and his burning zeal for the salvation of souls, to procure, at all costs, our own reconciliation with the Divine Justice. We are indebted for this Feast to a member of the illustrious family of the Corsini,—Pope Clement the Twelfth, who, however, was but the instrument used by Divine Providence. The holy Bishop of the little town of Fiesole ever sought to be unknown during his life, and God, who willed that he should be glorified by the whole Church, inspired the Sovereign Pontiff to inscribe his name among the Saints of the universal Calendar. Andrew the Saint, was once a sinner; his example will encourage us in the work of our conversion. Let us read the account of his virtues as given us by the Church. Andrew was born at Florence, of the noble Corsini family. He was the fruit of his parents' prayers, and was consecrated by them to the Blessed Virgin. His future was thus shown by God to the mother. She dreamt that she had given birth to a wolf, which went to the church of the Carmelites, and, as it entered the threshold, was suddenly changed into a lamb. Though his early education was one which was calculated to form him to piety, and to everything that suited his high birth, he, by degrees, fell into a vicious manner of life, notwithstanding the frequent reproaches made him by his mother. But as soon as he was told that he had been consecrated by his parents to the Virgin-Mother of God, and heard of his mother's vision, he entered the Order of Carmelites. The devil ceased not to molest him, even then, with manifold temptations; but nothing could make him change his resolution of entering the religious life. Shortly after his profession, he was sent to Paris for a course of study; having completed it, and taken his degrees, he returned to Italy, and was made superior of his Order in the province of Tuscany. It happened about that time, that the Church of Fiesole lost its Bishop, and Andrew was chosen as his successor. But looking on himself as unworthy of such a dignity, he hid himself so that no one knew where he was. But a child, who had not yet received the use of speech, miraculously revealed the place, outside the town, where he was; upon which the Saint, fearing that further refusal would be a resistance to the divine will, was consecrated Bishop. Thus exalted to so great a dignity, he applied himself more than ever to the practice of humility, which had always been his favourite virtue. To the zeal of a good pastor, he united tender compassion for the poor, abundant almsgiving, a life of prayer, long watchings, and other virtues; all which, together with the gift of prophecy he had received, gained for him a great reputation for sanctity. Pope Urban the Fifth, hearing of his great merits, sent him, as his Legate, to Bologna, that he might quell a sedition that had arisen in that city. The fulfilment of this charge cost him much suffering; but such was his prudence, that he succeeded in restoring peace among the citizens, and so preventing further bloodshed: he then returned to Fiesole. Not long after this, being worn out by ceaseless labours and bodily mortifications, and having been told by the Blessed Virgin of the precise day of his death, he passed from this life to the kingdom of heaven, in the year of our Lord thirteen hundred and seventy-three, and in the seventieth year of his age. Great was the reputation of his name on account of the many and wonderful miracles wrought through his intercession, and at length he was canonised by Urban the Eighth. His body reposes in the Church of his Order, at Florence. The citizens of that city, having often experienced that his Relics have drawn down the divine protection upon them in times of public calamity, their devotion to the Saint is very great. Hear, O holy Pontiff, our prayer: we are sinners, and would learn from thee how we are to return to the God we have offended. His mercy was poured out upon thee; obtain the same for us. Have pity on Christians throughout the world, for the grace of repentance is now being offered to all; pray for us, that we may be filled with the spirit of compunction. We have sinned; we sue for pardon; intercession like thine can win it for us. From wolves, change us into lambs. Strengthen us against our enemies; get us an increase of the virtue of humility, which thou hadst in such perfection; and intercede for us with our Lord, that he crown our efforts with perseverance, as he did thine; that thus we may be enabled to unite with thee in singing, for ever, the praises of our Redeemer. This saint at his baptism was called Andrew, from the apostle of that name, on whose festival he was born in Florence, in 1302. The family of the Corsini was then one of the most illustrious of that commonwealth. This child was the fruit of the prayers of his pious parents, who consecrated him by vow to God before his birth. But notwithstanding the care his parents took to instil good principles into him, he spent the first part of his youth in vice and extravagance, in the company of such as were as wicked as himself. His devout mother Peregrina never ceased weeping and praying for his conversion, and one day said to him, with many sighs, in the bitterness of her grief: “I see you are the wolf I saw in my sleep;” giving him to understand, that when with child of him she had dreamed she was brought to bed of a wolf, which running into a church, was turned into a lamb. She added, that she and her husband had in a particular manner devoted him, while in the womb, to the service of God, under the protection of the blessed Virgin; and that in consequence of his being born not for them, nor for the world, but for God, a very different kind of life from what he led was expected from him. This discourse made so strong an impression on his heart, that he went immediately to the church of the Carmelite friars, and having prayed there for some time with great fervor before the altar of our Lady, he was so touched by God, that he took a resolution upon the spot to return no more to his father's house, but to embrace the religious state of life professed in that convent. He was readily admitted, in the year 1318, and after a novitiate of a year and some months, during which he eluded the artifices of his worldly companions, and resolutely rejected the solicitations of an uncle who sought to draw him back into the world, he made his solemn profession. He never departed from the first fervor of his conversion. He strenuously labored to subdue his passions by extreme humiliations, obedience even to the last person in the house, by silence and prayer; and his superiors employed him in the meanest offices, often in washing the dishes in the scullery. The progress he made in learning, particularly in the holy scriptures and in divinity, was very great. In the year 1328 he was ordained priest; but to prevent the music and feast which his family had prepared, according to custom, for the day on which he was to say his first mass, he privately withdrew to a little convent seven miles out of town, where he offered, unknown, his first-fruits to God, with wonderful recollection and devotion. After some time employed in preaching at Florence, he was sent to Paris, where he studied three years, and took some degrees. He prosecuted his studies some time at Avignon, with his uncle, cardinal Corsini; and in 1332, returning to Florence, was chosen prior of that convent by a provincial chapter. God honored his extraordinary virtue with the gifts of prophecy and miracles; and the astonishing fruits of his example and zealous preaching made him be looked upon as a second apostle of his country. Among other miracles and conquests of hardened souls, was the conversion of his cousin John Corsini, an infamous gamester; and the miraculous cure of an ulcer in his neck. The bishop of Fiesoli, a town three miles from Florence, being dead, the chapter unanimously chose our saint to fill up the vacant see. Being informed of their proceedings, he hid himself, and remained so long concealed that the canons, despairing to find him, were going to proceed to a second election; when, by a particular direction of divine providence, he was discovered by a child. Being consecrated bishop in the beginning of the year 1360, he redoubled his former austerities. To his hair-shirt he added an iron girdle. He daily said the seven penitential psalms and the litany of the saints, and gave himself a severe discipline while he recited the litany. His bed was of vine-branches strewed on the floor. All his time was taken up in prayer or in his functions. Holy meditation and reading the scriptures he called his recreation from his labors. He avoided discourse with women as much as possible, and would never listen to flatterers or informers. His tenderness and care of the poor were incredible, and he had a particular regard for the bashful among them, that is, such as were ashamed to make known their distress: these he was diligent in seeking out, and assisted them with all possible secrecy. By an excellent talent for composing differences and dissensions, he never failed to reconcile persons at variance, and to appease all seditions that happened in his time, either at Fiesoli, or at Florence. Urban V, on this account, sent him vested with legatine power to Bologna, where the nobility and people were miserably divided. He happily pacified them, and their union continued during the remainder of his life. He was accustomed every Thursday to wash, with singular charity and humility, the feet of the poor; one excused himself, alleging that his feet were full of ulcers and corruption; the saint insisted upon washing them notwithstanding, and they were immediately healed. In imitation of St. Gregory the Great, he kept a list of the names of all the poor, and furnished them all with allowances. He never dismissed any without an alms, for which purpose he once miraculously multiplied bread. He was taken ill while he was singing high mass on Christmas-night, in the year 1372. His fever increasing, he gave up his happy soul to God with a surprising joy and tranquillity, on the 6th of January, 1373, being seventy-one years and five weeks old, having been twelve years bishop. He was honored with many miracles, and immediately canonized by the voice of the people. The state of Florence has often sensibly experienced his powerful intercession. Pope Eugenius IV allowed his relics to be exposed to public veneration. He was canonized by Urban VIII in 1629. His festival was transferred to the 4th of February. Clement XII being of this family, in conjunction with his nephew, the marquis of Corsini, sumptuously adorned the chapel of the Carmelite friars' church in Florence, in which the saint's body is kept. He also built and endowed a magnificent independent chapel in the great church of St. John Lateran, under the name of this his patron, in which the corpse of that pope is interred. 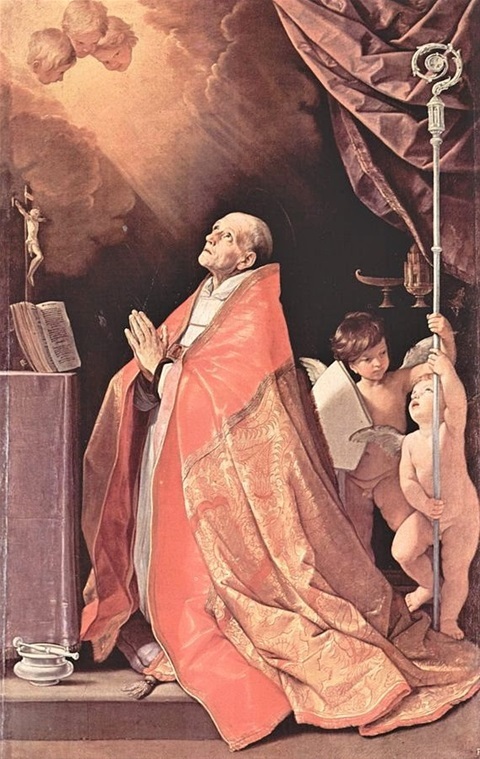 St. Andrew Corsini, pray for us.